From Kansas City go southeast to 71 Hiway and continue south. Take the Main Street exit at Grandview & continue south to intersection. Turn left and continue across the bridge and past the outer access road then turn right at the first street which is White Ave. Go to the second turn in and our offices are at the north end of building. 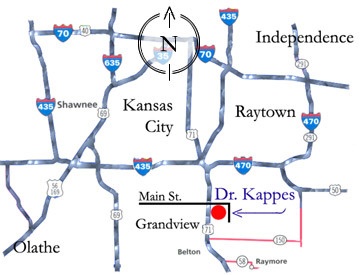 From Harrisonville or south of Kansas City go north on Highway 71 to the main street exit in Grandview and turn right at the light. Go one block and turn right and then turn right into the second driveway and my office is at the north end of the building. 816-765-5553, for information or to make an appointment.